You may have noticed the new ad banner in the right column. I’ve been looking into doing/taking some advertising for the Promises site for a little while now. Getting ads in was easy. There are loads of options for that. Designing one to go out on the other hand! Well, there’s a lot to consider. What do I really want to say to bring in readers, preferably without resorting to some kind of “yo mama’s so fat” tag line? While I was digging up reference, I tripped across a couple of sites that talked about how much advertising has changed since…pretty much the beginning of advertising. (The second oldest profession.) Before I know it, I’m completely side-tracked and reading through site after site of this stuff. By today’s standards, a lot of it would be considered ridiculous at best. Racist, sexist and outright liable at the worst. 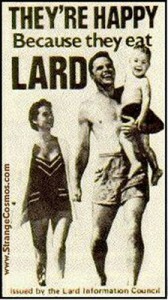 Either way, the “diet” and “health” ads cracked me up so I had to share at least a few of them. 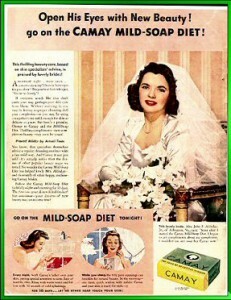 Let’s start with the Camay Soap Diet! When I saw this I was secretly hoping that it was telling women to eat soap, as it turns out though, you can lose all the weight you want just by washing your face a couple of times a day. And here I’ve been wasting all of that time and money at the gym! In fairness I have to admit that it’s hard to eat and wash your face at the same time so I suppose there is some merit there. The sugar solution!! This is awesome. My sister in law is a nutritionist and I think these would really make her head spin. 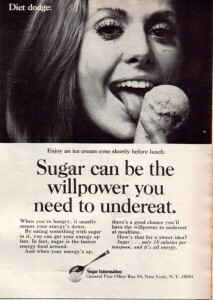 Apparently, sugar is a great source of energy so you can under eat at mealtime! YES! 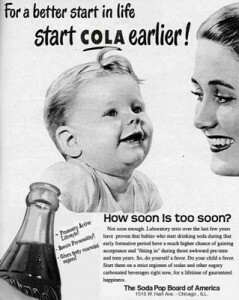 And the sooner you start your baby on cola, the sooner you can really get to work on that ADD and obesity problem after all, what’s milk but empty vitamins? All the good mom’s are doin’ it. Not into sugar? No problem! Not as long as there’s tapeworms! Perfect for the diabetic crowd. And don’t worry, they’ve been sanitized! 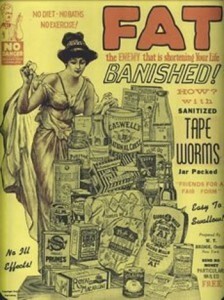 (whew) Nothing worse than an unsanitized tape worm. Who knows where they’ve been? Just don’t forget to wash your hands before taking your sanitized tape worms. 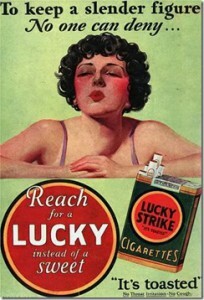 Cigarettes are a great way to stay slender. Nothing like cancer to really shake off that last ten pounds. Careful though, the surgeon general warns that smoking may harm your tape worm.